Hello my friends, It’s time for a brand new challenge over at Seize the Birthday and the topping this time around is ” Sunshine.” Of course what is sun without a little clouds thrown in? I may have gotten a bit carried away with my clouds…LOL. I thought it might be fun to change it up and use some DP instead the just plain old white or grey for my clouds. I like how it came out. I may have heated my embossing paste a tad to long as it started to bubble, as the picture shows. 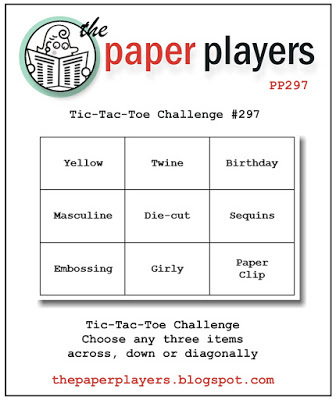 I am also linking this card up over at The Paper Players where they have a fun Tic Tac Toe theme this week. I chose to go diagonal which was …. Yellow, Die-Cut and Paperclip. I wanted a white paperclip but couldn’t seem to get my hands on one around the house, so settled for the traditional silver with a yellow ribbon. The stencil in from My Favorite Things, the clouds are from Lawn Fawn, and the sentiment is from Verve. Before I go, I need to mention 3 things! 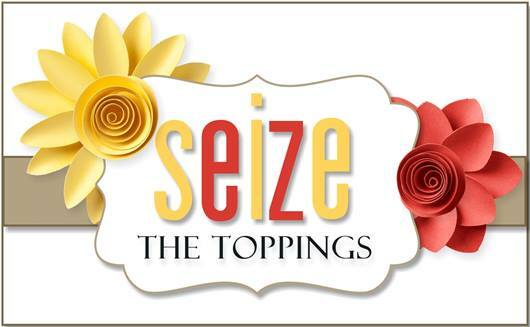 First, I want to welcome Patti from Stationary Styles to the Seize the Birthday team! She was a Surprise Party Guest with us the past two months and I just couldn’t let her sweet and talented self go! Welcome Patti and I am super glad you are with us!!! Next, I need to welcome our NEW Surprise Party Guest- Mynn Kitchen from On a Stampage to our team, she will be with us for the next two months! Mynn is super involved in the Stampin world and I am sure you are familiar with her beautiful work, if not you are in for a huge treat!! Welcome Myn!! Last, but certainly not least! 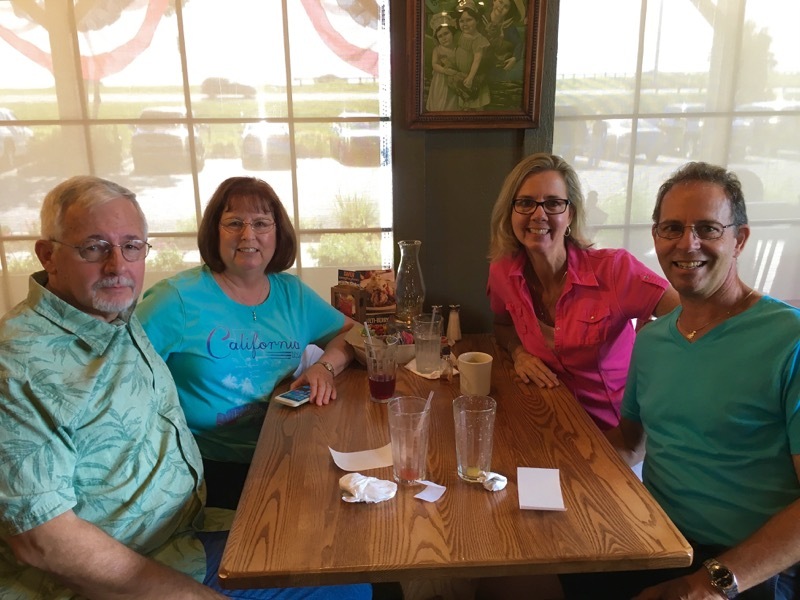 Hubby and I had the wonderful opportunity this past Sunday to meet up with a fellow STB and JUGS design Team member Sharyn and her hubby for breakfast! We had a very nice time it was just way to short, as they were taking a family trip that day with their son, daughter-in-law, and grandkids to Orlando! Here is a couple of pics, that some of you have already seen on Facebook, but I love to document important parts of my life here on my blog as well. Thanks for sticking with me through my long post! Come on over to Seize the Birthday and join us, and while your there help us welcome Patti and Mynn! Categories: Cards, Life in General | Tags: Card making, Cards, Happy Birthday, rubber stamps, stamping, Verve Stamps | Permalink. Pretty card Nancy. Love the big sunshine and pretty blue clouds. Love the photos of you and Sharyn. 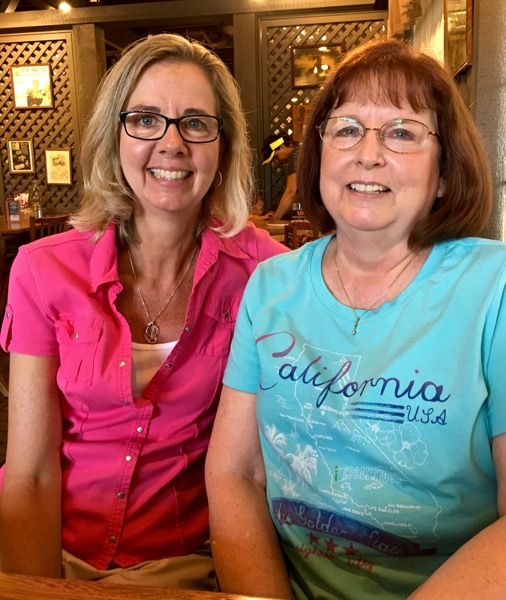 Glad she was in Florida for a visit and that you got to meet up. I wish I had been able to meet up with you both. I am getting better and still lugging this old black boot around. Hopefully I will be able to get rid of it Tuesday when I see the doctor. Oh I just love this bright and cheerful card!! Thank you, Nancy for the kind and sweet welcome! as always you bless my socks off!! How exciting to meet Sharyn and her hubby!!! You all look just fantastic! Love your embossed sun, looks great from here! Even your clouds look happy and ‘sunshiny’. GREAT photos, so fun for you all to meet up! I love those happy rays of sunshine! Fun card! So happy to have been able to spend time with you and Dave. We had a great time! Nancy, love you bright, cheery card and those clouds are just so adorable. Looks like you had a great time meeting Sharon. Fun. Love those funky clouds! Your card rocks! It’s so great that you were able to meet Sharyn face to face! How fun! 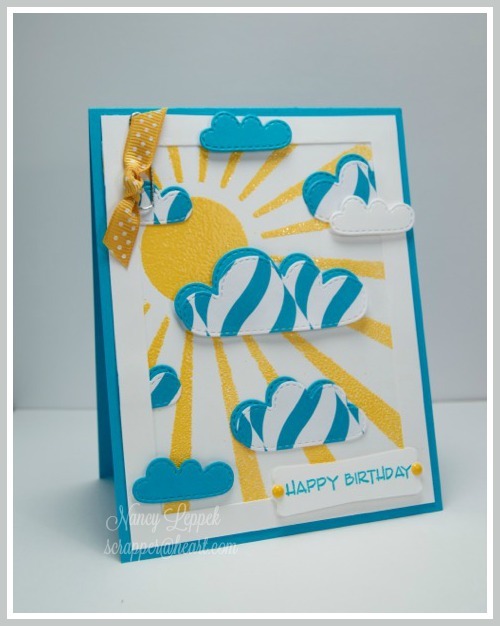 Nancy, AWESOME card…Love those beautiful clouds! What a great picture of the four of you! PS…Lin and I were NOT skyping when we both ended up using brushos…ha ha…I guess great minds think alike!! *wink *wink!! Nancy, this is so pretty with those summer colors. Love those adorable clouds. Nancy this is so pretty with those bright summer colors. Love those adorable clouds. Such a happy card! Love that sunburst and those super cool clouds. Thanks so much for playing along with us this week at The Paper Players! These cloud are the most fun clouds that I have seen in forever. Glad to see your pictures again of you and Sharyn. I love your card Nancy and I don’t think you went overboard with the clouds at all. I love all of the different layers done in the different colours. Just gorgeous!